About a year ago, my mom sent me an email about a book she had just read and really enjoyed, and so I downloaded it for my Kindle, and I finally got around to starting reading it a few weeks ago. It is a book about three very different sisters who make very different choices, and how their lives turn out, and frankly it was just a little heavy going for me, at least for right now. So I read something else, something that turned out to be the perfect book to read when the book your mother recommends to you is just too depressing, or when you miss your far-away friends, or when it’s an election year, or when there is weather of any kind, or, really, pretty much any time. Have you ever read Once on a Time, by A. A. Milne? If not, I think the time is now. As a little girl I was delighted by Milne’s Winnie the Pooh books. As an adult (and still delighted), I attribute it to a long-standing appreciation for nonsense. Looking back on it now, there was a certain something in the narrator’s voice, something I responded to and trusted, something that said, “Listen, I am going to tell you a story,” in such a way that I had to keep reading. “I am alone,” she said. “Dare I soliloquize? I will. It is a thing I have not done for weeks. ‘Oh, what a –’” She got up quickly. “Nobody could soliloquize on a log like that,” she said crossly. She decided she could do it just as effectively when standing. With one pale hand raised to the skies she began again. …they set out with no luggage and no clear idea of where they were going to sleep at night. This after all, is the best spirit in which to start a journey. It is the Gladstone bag which has killed romance. 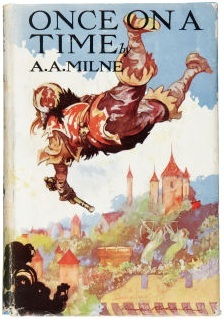 In the preface, Milne explains that he wrote Once on a Time to amuse his wife and himself in 1915, “at a time when life was not very amusing”. If you, like me, have lately found yourself in need of a little escape from oneself and/or the world at large, this little overlooked gem of a story might be just the ticket. This entry was posted in Books, Reviews, and Reading and tagged A. A. Milne, books, magic, reading on October 16, 2012 by ms.grammarian. As one of the overnight guests who was read to – I must add that there was, in addition, a pale hand, raised, as you read the first quote! ;- ) Loved it!!! And, yes, I am looking forward to reading this book! You have inspired me, yet again! WHAT THE WHAT?!?!?! I am going to buy this. Sounds like an adaptation for the stage is needed!